The Vacation Watch Dashboard module will show an overview list of all of the current properties that have been called in from the owners. If the date range of the entry matches the current date, it will appear on this view. When the dates have expired, the listing will automatically be removed from the list, but the data will be saved for future reference. This screen will give the Police Chiefs and coordinators the ability to see what properties are on the current watch list and assign an officer to check out the residence. If an officer wants to know more details on a property, they just click on the “View Details” icon to find out further information. Here they will find more information about the home owner such a: Name, Phone Number and Email. The even have access to length of vacation; if the home has an alarm system; if there are pets on the premises; is there a house sitter; and emergency contact information. When a property owner calls in to say they are going out of town, it is simple to add this entry into the Tool Kit. Simply click the “Add New” button and a pop up dialog box will prompt you to answer the necessary questions needed to create the entry. Once the entry is submitted, the data is stored permanently. Users can reference the information at any time if needed. Once the information is in the system, additional vacation watch requests are simple to add. Start out by entering their email ID. If it exists in the database, the system will auto-populate the rest of the information, you will only have to apply the new date ranges and the job is done. 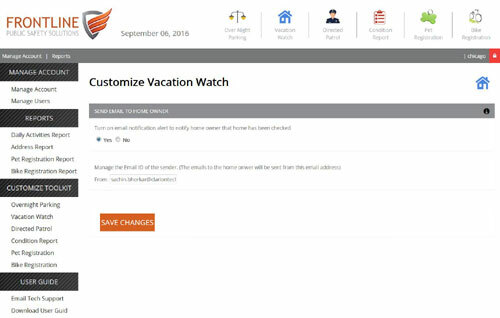 As an Administrator, the Vacation Watch module allows you to make a few modifications. You can determine if sending an email to the home owner is appropriate for your community or not. There is a simple “Yes/No” toggle that allows you to turn on and off the email capability. You can also manage the specific sender or “who” the email comes from. This may come from the Police Chief, Deputy or a Community Information Officer (CIO) that you select to represent the department in the email. Save Time and Resources by letting the residents enter their own data!